There are many benefits associated with going green. 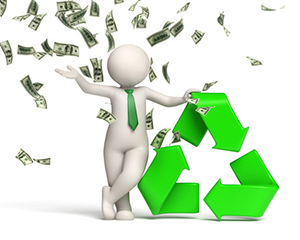 One of the most obvious is the money that you can make when you recycle scrap metals at your local scrap metal recycling facility. While there are some people who make a good living collecting scrap metal in the form of broken down appliances, vehicles and other parts, there are many more people who simply recycle the things from their home that would otherwise end up in the local landfill. Recycling glass, paper and plastics is something that most households in America do on a weekly basis. Trash companies handed out “green” trash bins to collect these items to help reduce the amount of things that end up at the landfill, but you can still recycle some items yourself to make some extra cash. Aluminum cans will add up quickly if you start cleaning and crushing them, collecting them in a trash bag or can out in the garage or shed, until you are ready to bring them into your local scrap metal recycling facility. However, there is always more that you can do. When you replace a large appliance, such as a washer or dryer, refrigerator or freezer, what do you do with those items? Did you know that you can take them directly to Mid City Scrap Iron & Salvage in Westport, MA and earn cash for them rather than paying someone to recycle them for you? And what about when you do a little bit of home remodeling? Plumbing, bathroom fixtures, sinks and even lighting fixtures are often made of metal that can be sold and recycled. But it doesn’t end there! Old filing cabinets, storage racks, television stands, floor lamps, car parts, window frames, screen doors, railings, basketball poles, trampolines, wrought iron furniture and metal fencing can all be sold and recycled. Again, rather than paying someone to take these items off your hands in the middle of a home improvement project, you could be making extra cash by simply taking them to Mid City Scrap and following the simple directions for recycling at the local center. If you have never taken items in for recycling it can be a bit overwhelming on your first visit. Items are separated by ferrous and non-ferrous metals, which can be easily identified with a simple magnet. Non-ferrous items are often worth much more than ferrous items and include aluminum, copper, brass and stainless steel. There are also different “grades” within each type of metal and that is how the price that you are paid for your scrap metal recycling will be determine. Visit Mid City Scrap’s website to view the simple 8-Step Guide to Recycling so you’ll know what to expect when you visit the scrap metal recycling facility. Used for: plumbing pipes, roofing materials, electrical wires, electronics, etc. One you get the recycling “bug” you’ll want to keep doing it – especially after you see how much money you can make without a lot of effort. Keep an eye out for neighbors who are doing remodeling, redecorating or other work on their homes and offer to take their scrap metal to the local scrap metal recycling facility. Store items in your garage or shed until you are ready to make a big trip out to Mid City Scrap in Westport where you can get the best prices for scrap metal in Southeastern Massachusetts. The holidays are often a great time to collect scrap metal and other recyclable items because people are usually too busy to take them in to recycle scrap metal themselves. If you have a good-sized truck and want to collect even more scrap metal locally, check the Penny Saver and Craigslist for people who are looking to pay someone to pick up old appliances and other types of scrap metal. Post your own ad and volunteer to pick these items up for free and add them to your stockpile of ferrous and non-ferrous metals for recycling. If you have friends or family who work in construction, plumbing, electrical work or as contractors, speak with them about collecting their scrap metal for recycling. Many will be happy to just get these things off their hands and will just give them to you willingly. Others may want to share in the profits, but just make sure that you figure in your time and gas money when you split the payout. In some cases, family or not, it might not be worth it. Bring Your Scrap Metal to Mid City Scrap! If you live or work in the South Coast region, which includes Rhode Island, Cape Cod and Southeastern cities in Massachusetts, such as New Bedford, Fall River and Dartmouth, bring your scrap metal to Mid City Scrap in Westport. You’ll get the best prices for scrap metal in Southeastern Massachusetts and be able to make cash for all of your ferrous and non-ferrous metals. To find out more about our hours or to get directions to our facility, visit our website or call us locally at 508-675-7831.